In March of 2008, I found myself in a pizza restaurant in Santa Rosa de Copán, Honduras. I was part of a Habitat for Humanity trip, and it was my first time out of the country. I wouldn’t have expected to find a pizzeria in this rural town in the mountains of Central America, but there we were. I wasn’t complaining, though. A long day of digging foundations and hauling wheelbarrows of dirt had left me with a formidable appetite. Plus, it was my birthday. I wasn’t expecting any kind of recognition for it, apart from a “happy birthday” from my dad, who was also on the trip. And yet, at the end of the meal, out came several of the wait staff singing feliz cumpleaños and carrying a giant cake to the table. It was my first time experiencing the immense hospitality of the people of Honduras, and it was my first time trying pastel de tres leches. As a middling Spanish student I gathered that this must be a “three milks cake” though I had no idea what that meant, and looking at the leaky whitish-yellow cube, I didn’t really think I wanted to know. But I discovered — as anyone who tries it has — that it is actually very delicious, and that the wet, spongy texture is surprisingly refreshing. It turns out that there’s a lot about tres leches that you wouldn’t expect, from its origins in medieval Europe to its corporate sponsorship in Latin America to its sudden fame halfway around the world in Turkey. While recipes vary from place to place, tres leches is essentially a sponge cake soaked in a milk mixture and topped with whipped cream or meringue. The three milks in question are evaporated milk, condensed milk, and whole milk or heavy cream. It may sound like an odd dessert choice to the uninitiated, but the cake is absurdly popular in Latin America. Plenty of countries claim to have invented tres leches, but Mexico has the strongest claim to the original recipe. Nineteenth-century recipes exist for antes, or sherry soaked cakes with custard, fruit, and nuts, in the Mexican states of Sinaloa and Oaxaca. It’s not hard to connect the dots from these antes to the tradition of soaked cakes in Europe. Dishes such as English trifles, Italian zuppa inglese, or Portuguese sopa dourada had been around for centuries prior, so it is likely that antes were a new world iteration of an old-world favorite. The cake tradition transitioned to what would be recognized as tres leches with the invention of canned milk. Canned milk — which is made by removing about 60 percent of the water content — was first developed in the mid-19th century and gained widespread use as a military field ration since it was easily transported and had a long shelf life. Canned milks were so popular for military use that during the World Wars, many companies such as Nestlé — which had been canning milk since the mid-1800s — had a hard time keeping up with demand. War caused obvious distribution problems throughout Europe and Asia, so Nestlé expanded production into Latin America where business flourished. Around this time, perhaps to boost sales in the local market, Nestlé began printing recipes for tres leches cake to go on their cans. And so the Mexican recipe with its roots in old-world Europe found its way onto market shelves throughout Latin America. Nowadays, tres leches is the standard celebration cake for much of Central America. Its popularity has also moved northward as it’s long been a staple of trendy taquerias in Austin and a familiar item on restaurant menus in Miami. In 2003, Häagen-Dazs and Blue Bell even debuted a tres-leches-flavored ice cream. But the surging popularity of a Latin American dish is not so surprising in the United States, which shares a nearly 2,000-mile border with Mexico and has more than 47 million Latinx citizens. What’s more surprising is the latest nation to catch the tres leches fever: Turkey. Around 2014, a new dessert called trileçe started popping up on menus across Istanbul, and it created quite a craze. Although everyone knew that they loved it, no one was quite sure where it came from. The word trileçe itself certainly seems to be a bastardization of tres leches, and the only real difference between the dishes is that in Turkey, the three milks in question often come from three different animals: cow, sheep, and goat. 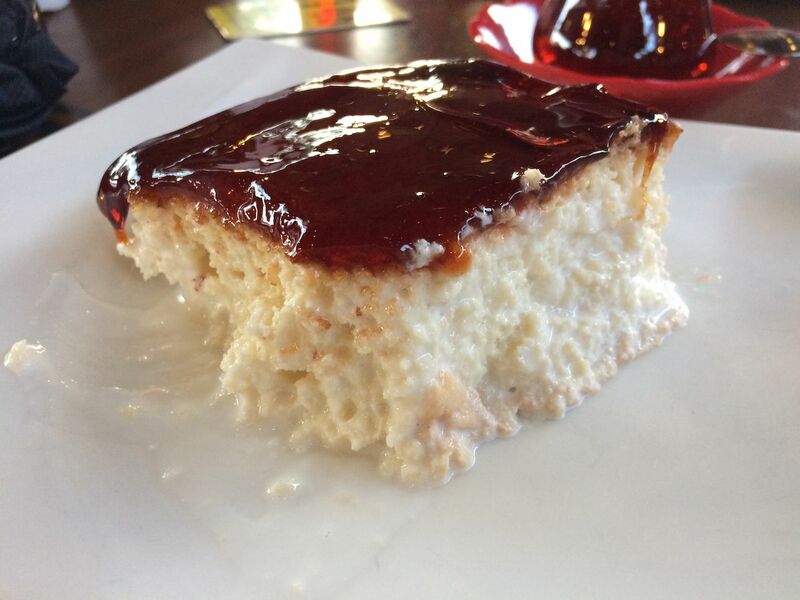 Albania was likely the first country in the Balkans to adopt tres leches. One theory holds that this time the recipe migration had nothing to do with medieval delicacies or milk-canning conglomerates. This time, it was all about soap operas. Soap operas are huge in the Balkans. As the story goes, Albania began importing Brazilian soap operas to keep up with demand. An episode of a Brazilian soap featured tres leches cake, and viewers were fascinated and inspired. They began reverse engineering the dish in their own kitchens, and before long the recipe — now dubbed trileçe — made it to the busy cafes of Istanbul. It’s a fascinating story and a quirky parable of modern globalization. However, the accepted origin story may be too simple to be true. For one thing, there’s no mention of the soap episode that tres leches appeared in, let alone the name of the Brazilian series. Furthermore, while it’s common for nations across the Balkans and the Middle East to import soap operas, those imports are coming mostly from Turkey. The soap industry is huge in Turkey. According to the Wall Street Journal, the Turkish soap industry was worth $130 million in 2012, with a large part of that owing to exports of its programming to the rest of the region. If anything, there’s more evidence of Turkish soap operas invading Latin America than the reverse. In 2014, Chilean television station Mega imported the Turkish soap Binbir Gece and dubbed over it in Spanish to create Las Mil y Una Noches. It became a major hit and sparked a rush on Turkish soap imports. Before long, Turkish series dubbed in Spanish were airing in Brazil, Peru, Uruguay, Bolivia, Paraguay, Ecuador, Colombia, Costa Rica, and more. So once again, it seems, there is a transnational mystery surrounding the simple soaked sponge cake. And while it is not clear what path tres leches took to become trileçe, its story is as rich as the dish itself and a sweet reminder that in our globalized world there is little that belongs solely to one culture or another, and so much that brings us together.